Construction is expected to start next year on a new race track to develop motorsports in Sabah at a cost of RM132 million. The circuit will be developed by KKIP Autocity, a Sabah state government company, at the second phase of the Kota Kinabalu Industrial Park. “The land for building this race circuit has been identified and is in the process of being transferred,” said Deputy Chief Minister Datuk Seri Wilfred Madius Tangau in a Bernama report. Tangau made the announcement during the launch of the KKIP Sabah Drag Battle 2018, last weekend. According to Tangau, who also holds the Minster of Trade and Industry portfolio for Sabah, the race track will contribute to the development of tourism and recreation in the state whilst opening up opportunities for small and medium businesses in the motorsports and automotive arena. “This will reduce the involvement of youth in illegal racing and encourage them to take up healthy and quality pursuits,” said Tangau. This news follows a proposal from Selangor Chief Minister Amirudin Shari to build a race track in Gombak. The proposed track with a seating capacity of 1,000 and associated facilities will sit on 20 acres of land and be constructed as a Public-Private partnership. RM132 million beter provide free public transpot. Malaysia cannot even hold F1 without losing money. Now we want to build this. Typical malaysian. Think F1 is the only motorsport. Motogp, superbike, cubprix, endurance race, GT, Touring car plenty of other types of motorsport that could be enjoyed by normal citizens, not just privillaged few. yes, need grass roots events. Tangkak track RM14 million (motorbike only), proposed Sg Petani track RM30 million (car and motorbike). How come this costs RM132 million? can race trucks as well..
Tangkak surface damaged already coz insufficient budgeting. Sg.Petani will never be sanctioned to race cars. Go kart maybe. Minimum budget for a circuit now is RM50mil for anything under 2km (inc. safety and quality). Add more if need spectator facilities or integrating few types of msports. This is nothing compared to the government spending >RM200mil to host each round of F1. Sabah needs a proper circuit. Automotive enthusiasts here have grown tremendously last few years. Let’s hope all the money will be spent building the track instead of lining politician pockets. Rm32 million build track, Rm100 million put into pocket. Sabah is so poor. Many families don’t even have food to eat. Most of their schools don’t even have fans. Most of their schools have no tables and chairs for the students to study. The poverty levels in Sabah is so bad due to 60 years of heavy duty corruption and plundering of money. And now, they want to build a RM130 mil race track? Is there something wrong with the brains of the Government? Like I always say, political parties may change but the same Government servants are still there. Low intelligence and no vision to help the poor. Ini salahan current Sabah CM. Previous CM was more pragmatic. Hope he wins his court case and become our CM again, just to stop these shenanigans. Ask Aaron Kwok to fund it! What is the purpose we need so many race track? 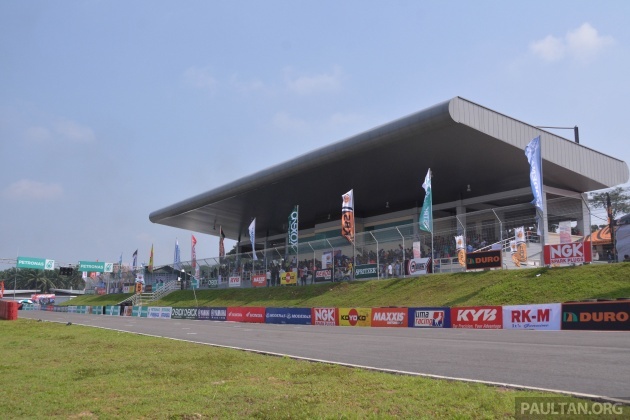 Will these race tracks bring good economic to the country? these news spread out just to pleased those motorhead, because it just had a drag race event last weekend, else no news to publish. good thing is, finally we can find some talented driver (hopefully) in East Malaysia instead of pure West. bad thing is, sabahan is poor (well… mostly)!!! 132M can do lots of thing! It will be interesting to see the circuit layout. Oh gov… why you don’t plan to use this RM132 mil to repair and build new/more road in Sabah? Do you think this race track can be more beneficial to Sabahan instead of normal roads? I am all for it! Why not a race track in Sabah? Maybe we can get fresh talents from our grassroots there? Just don’t forget to integrate a go kart track as well since most racers start with go karting. Next Post: Toyota to make TRD and AWD standard for all models?